In the hustle of solving issues, occasionally, you might find the same issue logged by different people. If you find issues that are really a duplicate of each other, you can mark one as a duplicate of another. Navigate to the issue detail page. At the bottom, click Change Status and select "Duplicate Issue". (If you don't have the Change Status option, but you have permission to edit the issue, you can perform the same action from there). A dropdown will appear below the status dropdown. Here, choose the other issue in the project that this issue duplicates, optionally add a comment, then hit the Submit button. 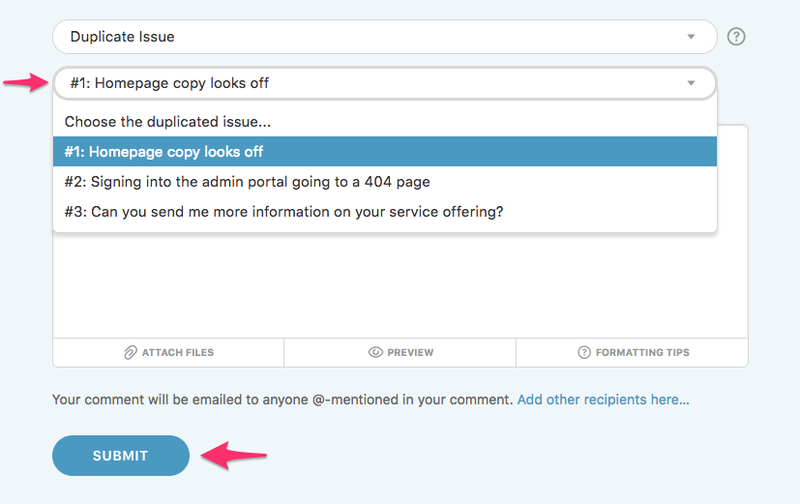 The issue is now marked as a duplicate, and will now appear in the All Inactive Issues list in your popular filters. You can also link to the parent issue from the duplicate, and vice versa.